The flexilink jumper is a non-pluggable board-to-board connector that can be used in a variety of situations. Its space-saving design and high current rating make it a winner.A board-to-board distance of 1 mm and a footprint of only 3.8 mm on the circuit board enable maximum use of space and a range of applications. For example, the connector can be used to ‘daisy chain’ LED boards. The circuit board connector is a mere 2 mm high. 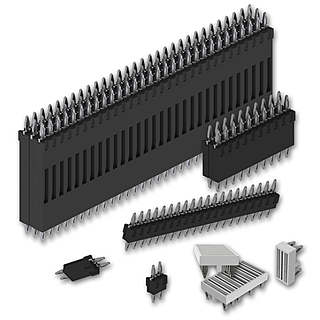 flexilink is the perfect solution when you are looking for a high-quality pressfit connection for PCB stacking. The advantages are obvious: with only one element you create a mechanical as well as electrical connection. Standoffs are redundant, which saves costs and space on the PCB. In addition you can choose within a range of 5 up to 25 mm board-to-board distance and combine different rows and contact numbers. The flexilinkjumper connector is available with 2 to 15 contact bridges. The distance between rows is 2 or 4 mm depending on the pin configuration.